The first thing I noticed when I tried to read the inscription was that the text was disposed in a way I wasn’t expecting. Being the decoration made of two mihrab, I was expecting the text to be disposed inside the niches: the first part in the one on the left, the second part on the right. Actually the lines do not ‘consider’ the boundaries made up by the mihrabs. This was a first peculiarity. My second consideration was the size of the tile panel: it is about 50 cm tall and 32 cm wide. Quite a big tile. Yet, not big enough, to my point of view, to be a real mihrab functioning as a prayer niche. Also, depicting two two-dimensional mihrabs I would tend to exclude a function strictly related with the prayer. 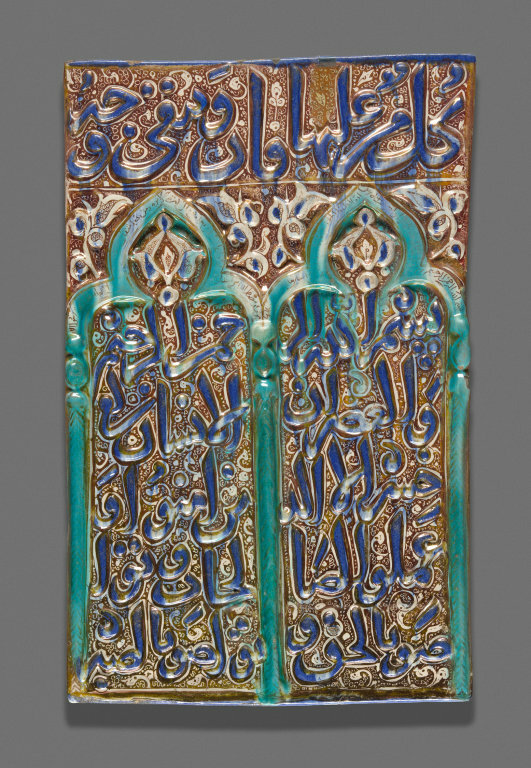 The tile has two inscriptions in a cursive style which is typical of its period: 13th century Iran. The content is enlightening for defining the function of the tile. It is clear that the verses refer to a funerary context. The fact that the last part of the quotation is omitted does not mean that the quotation continued on adjacent tiles: the fact that the words at the right of the band are arranged to fit and fill the space, would mean that the quotation was finished. Also, elsewhere it was made clear that a pious Muslim can recognise the entire quotation and its message even when reading just part of it. In the name of God, the Merciful, the Compassionate. By time, indeed, mankind is in loss, except for those who have believed and done righteous deeds and advised each other to truth and advised each other to patience. In this case the quotation refers to those believer that have “done righteous deeds”: these believers will not be lost when the time arrives (i.e. when they die). It is not the first time that Qur’anic quotations give us hints regarding the context in which the artefacts was produced and placed. In this case, both the decoration with the two-dimensional mihrabs and the inscriptions clearly point out that the tile could have been placed in a shrine or mausoleum, as decoration. It can also have been a gift for the shrine. Who was inside the shrine? Which shrine was? Sorrowfully the inscription cannot give us all the information we would like to know, yet, it provides enough information to better understand the production context. So, who says that Qur’anic quotations are not that important? S. S. Blair, Islamic inscriptions, Edinburgh 1998.